Flipboard has carved out a niche as one of the leading news and content-consumption apps for mobile devices like smartphones and tablets, with its digital-magazine look and easy user interface. Now the company wants to turn all of those content consumers into publishers as well: a new version of the app will be released today that gives users the tools to create their own topic-specific magazines. It’s a little like Pinterest merged with Tumblr, crossed with a better-looking and more social version of Google Reader. Flipboard has always had curated topics such as technology and sports, where the service uses a combination of human editors and algorithms — based on frequency of sharing and other metrics — to highlight specific content. 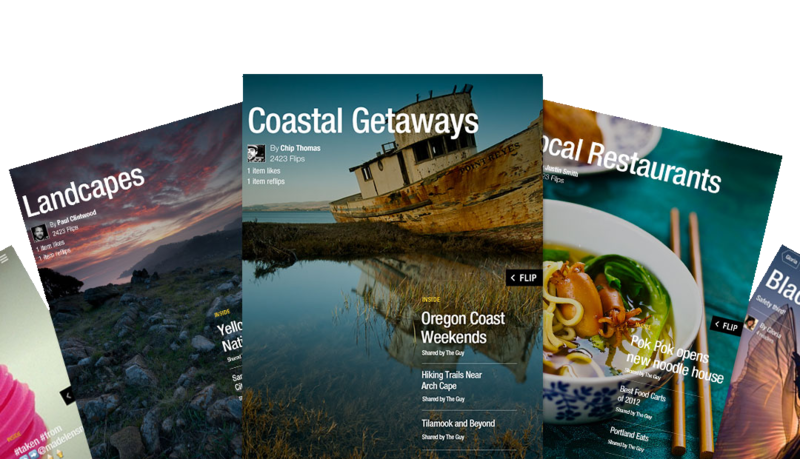 In effect, the new tools allow any Flipboard user to take on the same role as an editor and create their own magazine around a topic, and share it with other users. In a nutshell, users with the new features (which are available only for iPhone and iPad currently, but will appear in an Android version soon, according to the company) can simply click a “plus” sign next to a blog post or article they are reading — as well as any video or audio content that appears in their stream — and add that piece of content or “flip it into” to a magazine, which will then be available to them or any other user who searches for that topic. And Flipboard isn’t just giving users that ability within the app: the service is also launching a bookmarklet that will allow users to pull in content from anywhere on the web — whether it’s a blog post, a news website or Twitter and Facebook — and add it to their custom-created magazine. In a sense, Flipboard is trying to capitalize on the same curatorial impulse that makes people create collections about specific topics on Pinterest or re-blog photos on Tumblr, and in many ways this move is a shot across the bow of those other services. It’s also clearly a threat to the existing publishing industry, since a Flipboard user can now create their own custom publication using the content that comes from dozens of different magazines, blogs, websites and other sources. So Flipboard is trying to bring publishers in as well and get them to create their own custom magazines — such as a magazine about the Beatles created with archival content from Rolling Stone. It has even built e-commerce functionality into the app so users can click and buy directly from within an article or ad. But the most subversive aspect of the new features from a media-industry point of view is that they can be used by anyone — including advertisers. If an advertiser can create their own magazine by pulling in their own editorial content as well as content from other sources, and build e-commerce functionality into it, then it gives new meaning to the idea of brands as publishers and media entities. The YouTube ID of I9dv5QVs2_c?rel=0 is invalid. The new version of the app will have a section called “By Our Readers” in the table of contents, which will include a mix of magazines that have been created by users on a variety of topics — a small group of beta testers (including GigaOM) have had access to this function for several months. As with the other Flipboard sections, some of the magazines that are highlighted will be chosen based on the number of times they have been shared, and others will be chosen by editors. Like most news-aggregation and recommendation apps such as Pulse and Zite (which is owned by CNN), Flipboard users have always had the ability to share specific stories or items, but the new magazine-creation features effectively allow a user to spend some time creating a collection of content they can then share all at once. Feng used the example of an editor who is getting married soon and created an entire magazine with content about weddings. In a way, the new version of the app also picks up where Google Reader and other RSS services left off. Instead of just passively consuming text and photos in a chronological timeline or series of folders, Flipboard turns everything into part of a magazine-style experience. According to Feng, many users have already imported their Google Reader feeds into the app, and those feeds will be available once Google sunsets the service in July. I would use Flipboard if they had a way to access it from any device, not just smartphones or tablets. Technology may be moving faster than the legal system. How will this deal with intellectual property rights relating to re-use of copyright articles or excerpts from articles? This could expose these new ‘publishers’ with unexpected liabilities! Will individuals, who assemble their own magazines using their own original content (written, photos, video etc.) using Flipboard 2.0, have the ability to make money from advertising? If so what is the revenue share? Imagine someone’s magazine showcased by Flipboard becomes very popular (like a popular blogger) and they generate a dedicated audience, it would be great if they could sign up an advertiser for that audience. This could turn into something really great (just so long as the original content authors maintain copyright and there is no assignment of rights to Flipboard). But questions remain. What if you want a public magazine but you do not want to give other Flipboard users right to re-use your content in their magazines? Or in some situations you might be more than happy to share some or all of your content with others? In other words, where does the spectrum of Creative Commons licenses come into play? This seems like a very natural next step for Flipboard, and I think it needed it… the platform was starting to feel a little stagnate. It will be interesting to see if a vibrant community sprouts up once this has a wider roll-out. To my mind, the finer points of how fellow “publishers” share/interact will be key.